You have the perfect gift, but what about the perfect presentation? From confetti to 3D butterflies to tiny pack animal friends —and don’t forget the pasta bow on top—here are 6 clever ways to ​wrap your gifts for any occasion. You don't even need a huge arsenal of expensive wrapping papers. We'll show you how to take common household items and turn them into the sweetest present wrappers. If your gifting something small like jewelry or gift cards, these tiny animal boxes are a fun and whimsical way to present your small gift. 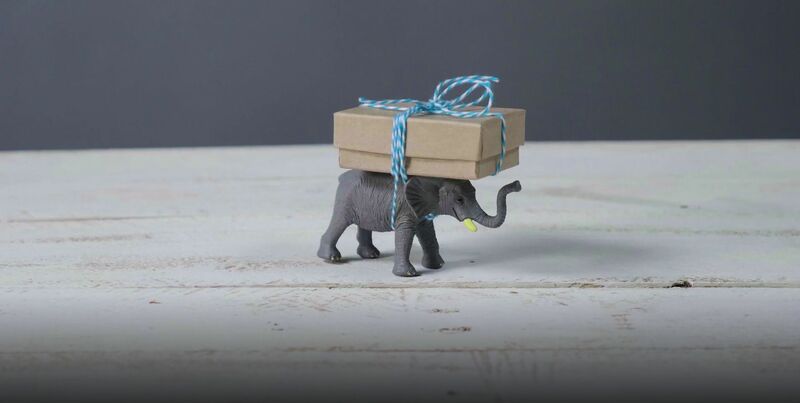 For a unique party favor idea, create a herd of various animals with boxes for guests to choose from on their way out–an especially adorable idea for a child's birthday party! Use twine to attach the boxes to the backs of the plastic animals, wrapping in different directions and tying in a bow. Perfect for birthdays, graduations or any cause for celebration, this fun confetti wrap will shake up the look of ordinary wrapping paper. Wrap your gift in plain, solid colored wrapping paper. Neutral colors work well. You could also use brown craft paper. Now wrap your gift in cellophane, and leave one end open. Cut up small pieces of colorful construction paper to make confetti. Cut out various shapes, like rectangles and triangles. You could also use a hole punch to make circles. Another option is to also add tinsel and glitter for sparkle. Pour the confetti mix into the open end of your cellophane wrapped gift. Tape it closed and shake it up. Attention to detail in your wrapping shows you put a lot of thought into the gift. These cute little bow-ties finish off any wrapped gift–the pastabilities are endless! Wrap your box in white paper, if it’s not white already. Use the twine to wrap the box in both directions, so the twine meets in the middle at the front of the gift box. Tie your twine together beneath the pasta bow, where it's hidden. This colorful candle idea would work so well for a birthday gift! Choose washi tape in a variety of colors and patterns to create a truly unique wrapping surface. Wrap your gift in solid colored wrapping paper. Cut a variety of washi tape pieces in equal length to create candlesticks. Height and number of the 'candles' depend on the size of your box. Cut teardrop shapes out of the yellow paper for the candles’ flame. It may help you to draw the shapes first in pencil, and then cut around the outline. Cut small pieces of twine to create the candle wicks. Stick the washi tape to the package, being careful to leave the top of the tape unstuck so you can place a piece of twine under each piece of washi tape. Stick the top of the tape down over the twine. Use a dot of glue to attach the yellow flames to the top of the wicks. For a simple, yet elegant touch to your wrapping, a little ribbon and lace goes a long way. This pretty wrapping idea is perfectly suited for weddings or bridal showers. Cut a piece of lace long enough to go around completely around your box. Wrap around the box, and as you go, attach all the way around with tape or glue. Placing the lace slightly off-center is an interesting way to wrap the box. Wrap the ribbon around the gift box over the top of the lace and tie a bow at the front. You may opt to use a tiny amount of glue or tape to better secure the ribbon to the box. If you are using glue, be careful not to use too much as it may seep from under the ribbon and cover the lace. Trim the ribbon as needed. Kids will especially appreciate this fun wrapping idea! Wow your own kids, or your kids' friends at their next birthday party by sending your kids along with this uniquely-wrapped gift to present to their friends. Wrap the gift in solid colored tissue or wrapping paper, using two or more colors. The use of multiple colors will create a fun effect at the end. Cut out a piece of reversible wrapping paper to fit the gift. Decide which side of the paper you'd like to be the outward-facing wrap on your gift. Place that side face-up on your cutting surface. Choose the area of paper where you want to create the design. To create the 3D effect, draw half of your desired shape on the wrapping paper. Vary the size of the shapes to make the pattern more visually interesting. Using an x-acto knife, carefully slice along the design you drew in Step 4. Be sure to do so over a safe cutting surface. Gently wrap your gift with the paper with the cutout design. Lay your gift facedown on top of the paper to preferred position. Take care to not tear the cutouts! Fold back the cut-out shapes to reveal the full design, and use a marker to add detail, if desired.